Slice the pickles, or gherkins if you will, lengthways. Mix up a simple batter that's about 1/2 a cup (70g) of flour, a couple of teaspoons of smoked paprika and cayenne, and a dash of salt and pepper. Slowly add about 175ml of cold water, mixing until you've got a smooth, thick batter that coats the pickles evenly. 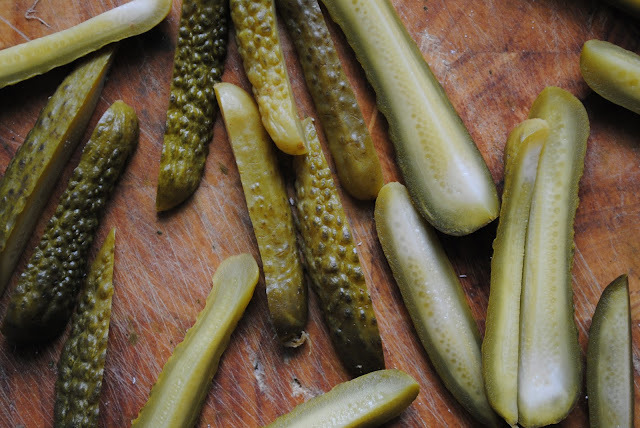 Bung your pickles in the batter and give it all a good mix before shaking off the excess. Get some vegetable oil nice and hot then deep fry your pickles in batches for about 2 minutes before fishing out with a slotted spoon and draining on kitchen roll. Hot, crispy, tangy. Pull together a nice little dipping sauce by combining a dash of milk, a few tablespoons of mayonnaise, a teaspoon of horseradish and tomato puree, a hit of cayenne and some salt and pepper. Scatter, grab, dunk, crunch, chew, swallow, repeat. These guys are the bomb.